Prior to 1834, all of these made use of local workhouses whose location often shifted over the years. The Westminster Poor Law Union, formed in 1868, and the City of Westminster Poor Law Union, formed in 1913, were created at the latter stages of a long series of poor-law adminstrative reorganisations in Westminster. The chronology of these changes is given below. 1728 - St John the Evangelist parish formed from part of St Margaret's parish. 1762 - Governor and Directors of the Poor of St James constituted. 1789 - Governor and Directors of St George Hanover Square constituted. 1835 - St Martin-in-the-Fields Poor Law Parish constituted. 1836 - Strand Union constituted from St Clement Danes, St Mary le Strand, St Paul Covent Garden, the Savoy Precinct and the Liberty of the Rolls. 1837 - St Annes, Soho, joins Strand Union. 1851 - Governor and Directors of St Margaret and St John constituted. 1868 - Westminster Union constituted from St James parish and St Anne's, Soho. The parish of St Martin-in-the-Fields joined the Strand Union. 1870 - St George's Union constituted from St George's Hanover Square and St Margaret and St John, Westminster. 1875 - Close of Collegiate Church of St Peter joins St George's Union. 1913 - Westminster Union, St George's Union and Strand Union amalgamate to form City of Westminster Union. The Westminster Poor Law Union was formed on 16th March, 1868, from the parishes of St James, Westminster, and St Anne's, Soho. Its administration was overseen by a Board of Guardians, 18 in number, comprising 12 guardians from St James and 6 from St Anne's. The population falling within the new union at the 1861 census had been 52,752. The new Westminster Union took over the St James' workhouse at Poland Street. 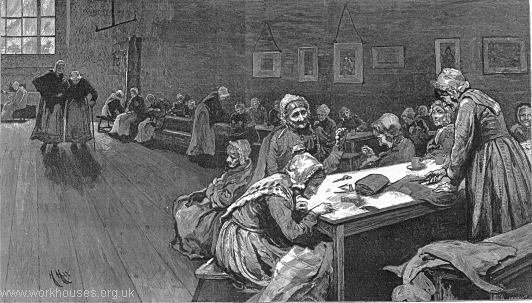 In 1877, the aged women's ward was the subject of an illustration by Hubert von Herkomer entitled Old Age — A Study at the Westminster Union which appeared in the weekly magazine The Graphic. The following year, Herkomer rendered the same scene as an oil painting now retitled Eventide. The City of Westminster Poor Union, formed in 1913, inherited workhouse sites from St George's Union at Fulham Road and Wallis's Yard, from the Strand Union at Edmonton. The union also purchased a tuberculosis hospital at Colindale from the Central London Sick Asylum District. In 1920, the Colindale site was re-sold to the Metropolitan Asylums Board. London Metropolitan Archives, 40 Northampton Road, London EC1R OHB. Holds most of the Poor Law Union records for Westminster. The City of Westminster Archives Centre holds many pre-1868 records for Westminster parishes.